In a recent interview, I brought up the topic of how fashion and art go hand in hand together. I studied art so I pay a lot of attention to fine details such as lines, shapes and colors. It is not a coincidence that I wore this particular sweater holding this particular clutch in front of this particular wall. 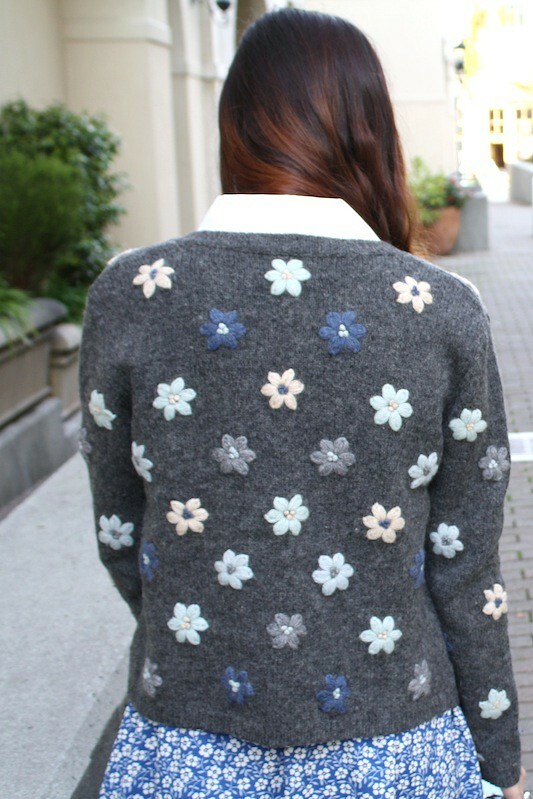 The abstract lines and shapes on the sweater make a nice contrast with the orderly tiles on the wall. Since my outfit and the wall are beige and black, I wore my red Jeffrey Campbell Tardy to make this rather monochromatic outfit pop a little. Thrifted vintage abstract oversize sweater by Jones New York. 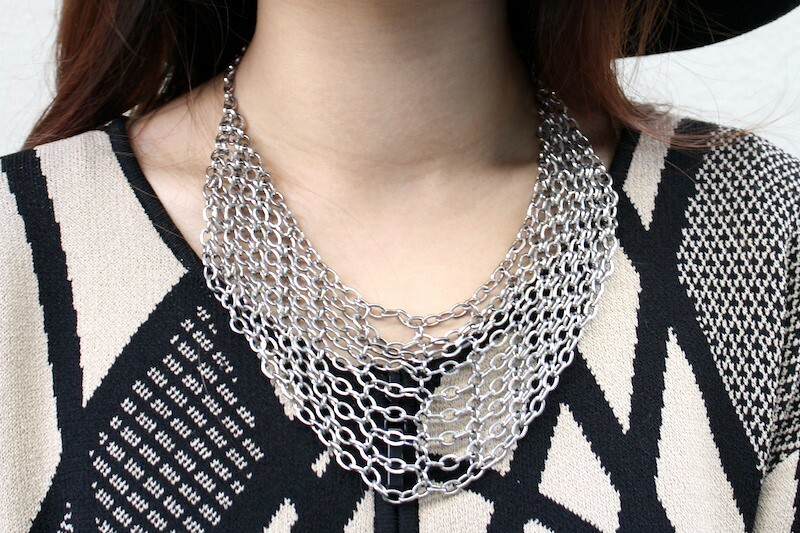 Silver chain link necklace from F21. Leather leggings from Hong Kong. 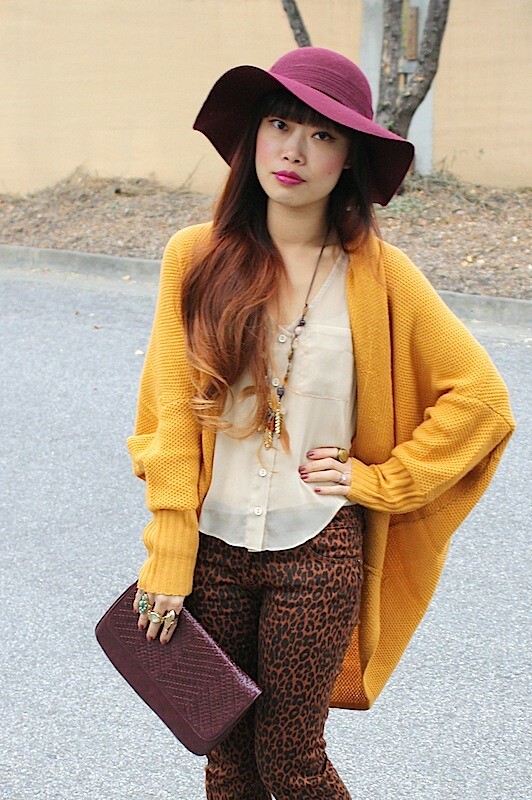 Black floppy hat and clutch from my work Sway. 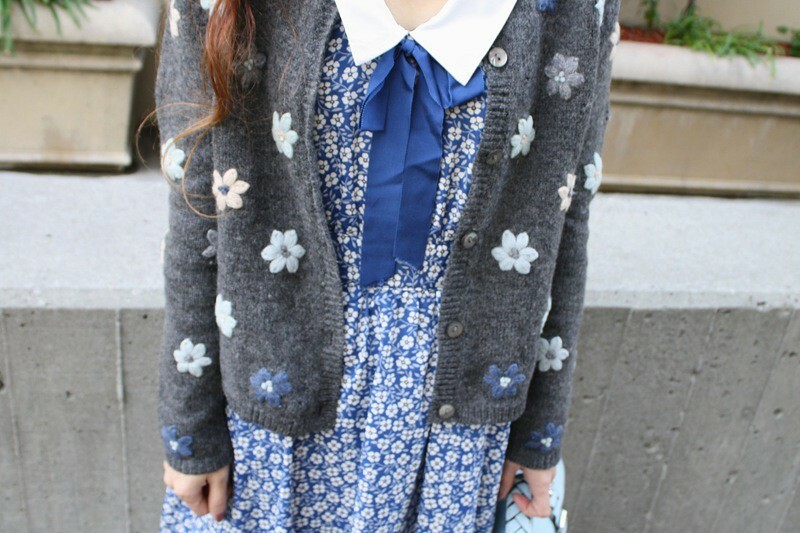 If you look closely, the flowers on the dress and the flowers on the cardigan are quite similar! 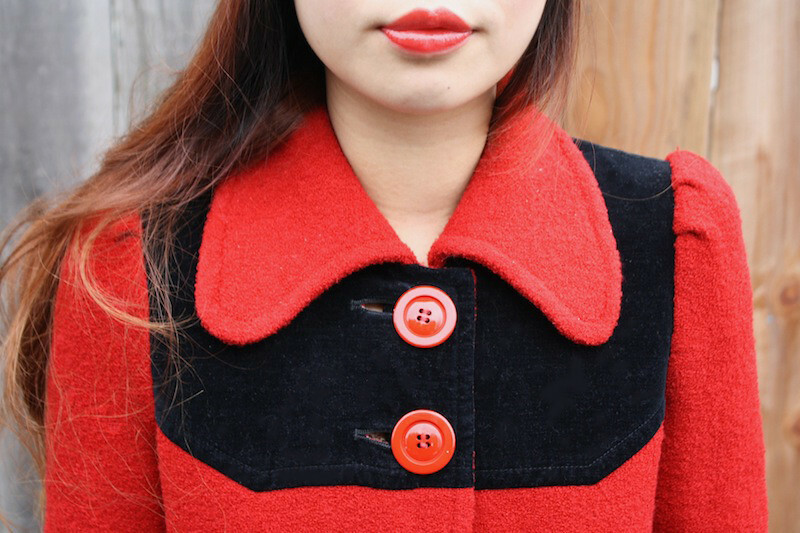 I adore this vintage wool cardigan, it was such a great thrift shop finds! 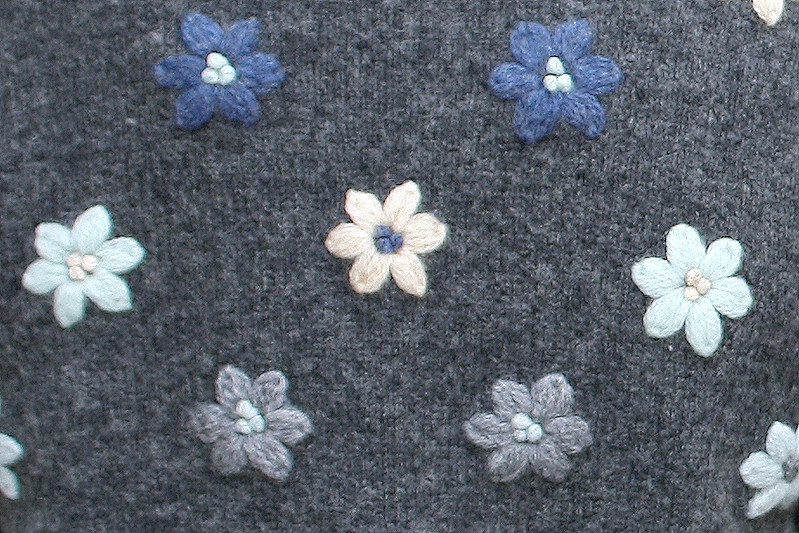 I really love how the flowers are heavily embroidered, so heavy that they pop a little which is amazing! 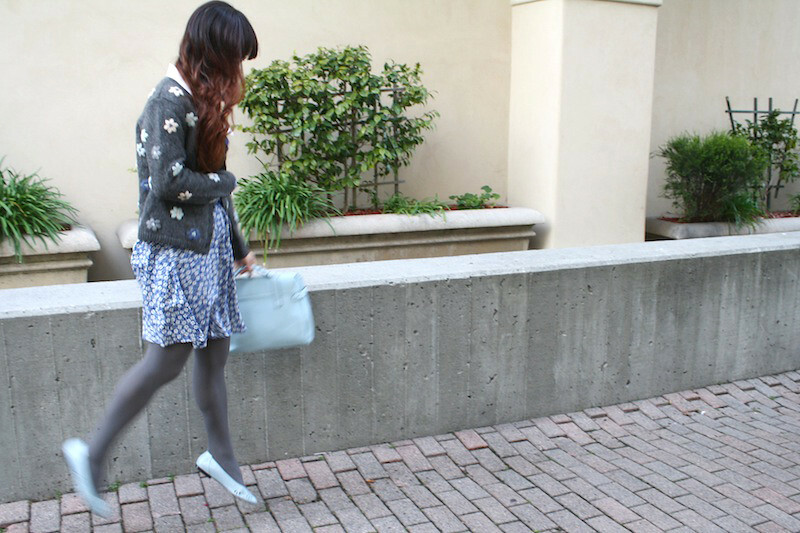 Oh, and just so happened that I have this handbag and flats in the exact shade of robin egg blue as some of the flowers on the cardigan... how excellent when you want to match from head to toe! 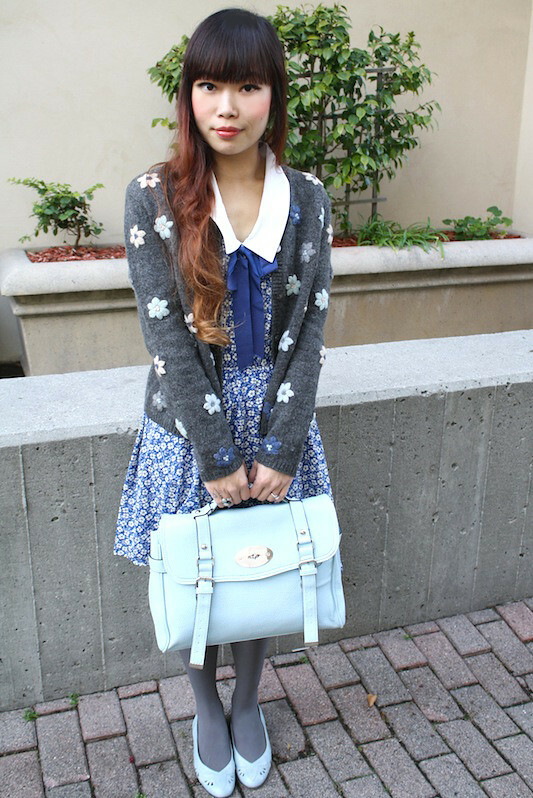 Thrifted vintage flowers wool cardigan by Newton Trading Co.
Floral collar dress from F21. 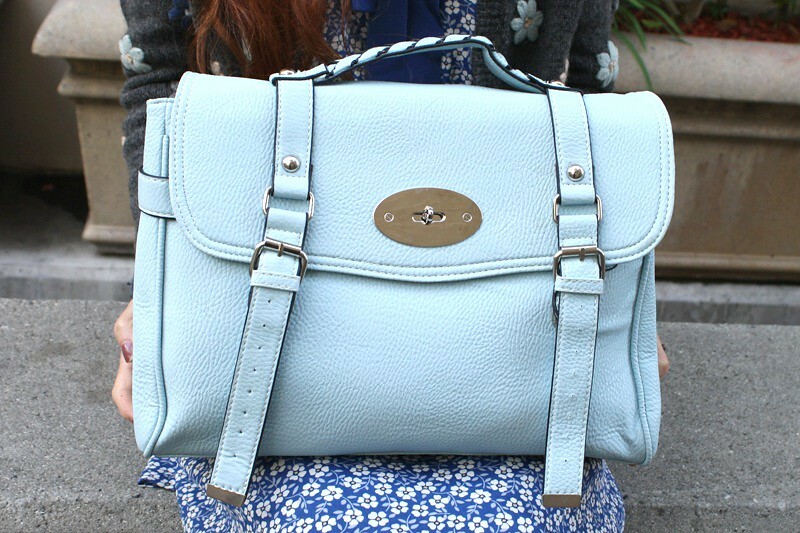 Robin egg blue leather satchel from Hong Kong. Vintage robin egg blue leather flats by Pappagallo Plus from Ebay. Happy Chinese New Year! People always think that I am Japanese because of my name, but I am actually Chinese. Long story short... my dad grew up in Japan, speaks Japanese fluently, and worked there for many years, and so he decided to give me a Japanese name. For Chinese New Year, I wore red and gold. 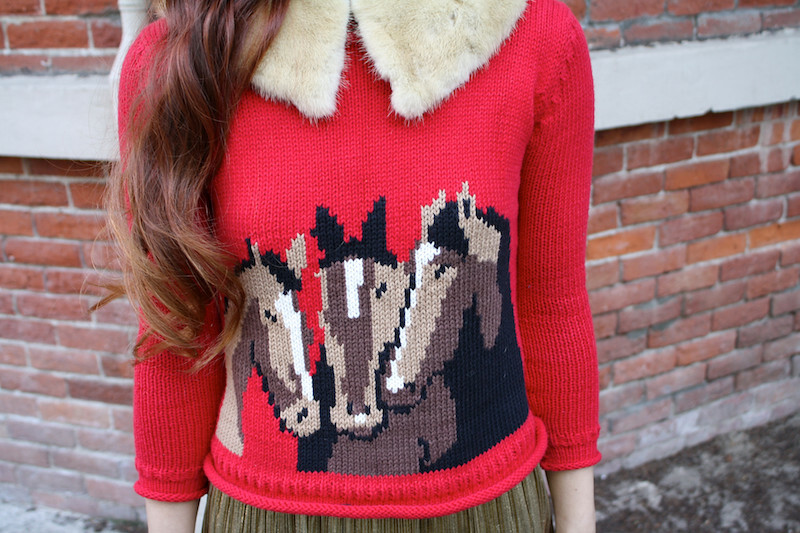 An adorable vintage sweater with horses, vintage fur collar, shimmery gold pleated skirt, leopard wedges, and red lips of course. And... CONGRATULATIONS to Amanda of Done n done! 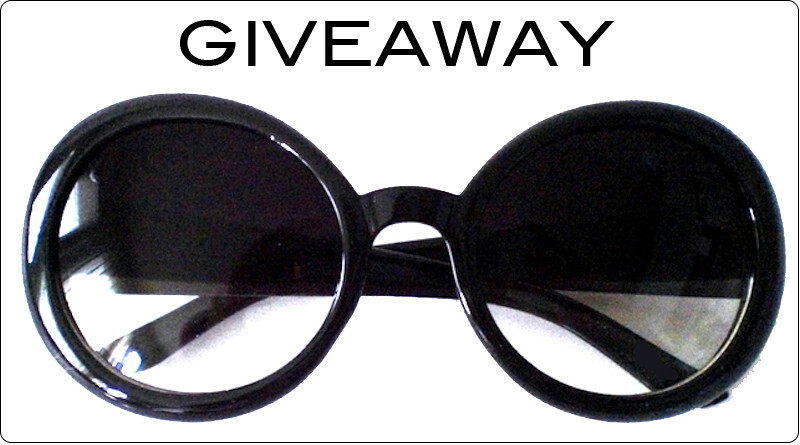 She is the winner of my half tint sunglasses giveaway! For those who didn't win, the sunglasses are available on my shop it's not her, it's me. Stay tuned for another giveaway soon! Thrifted vintage sweater with horses. 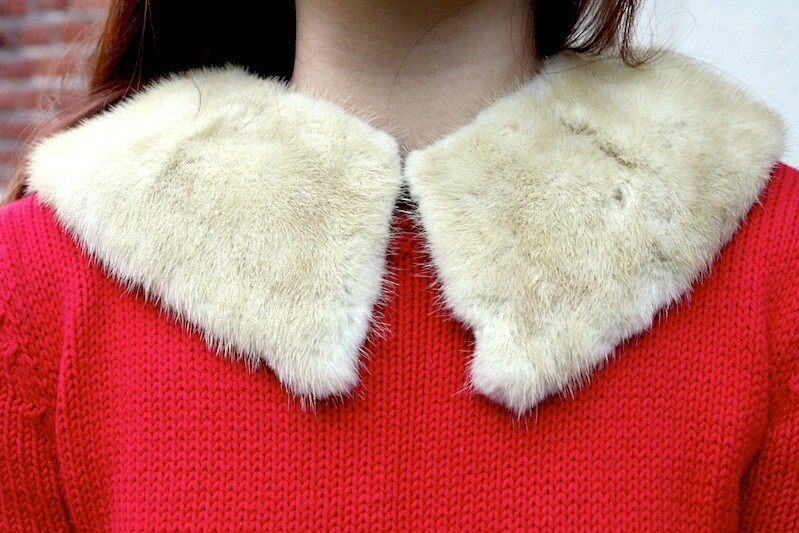 Vintage fur collar from Etsy. 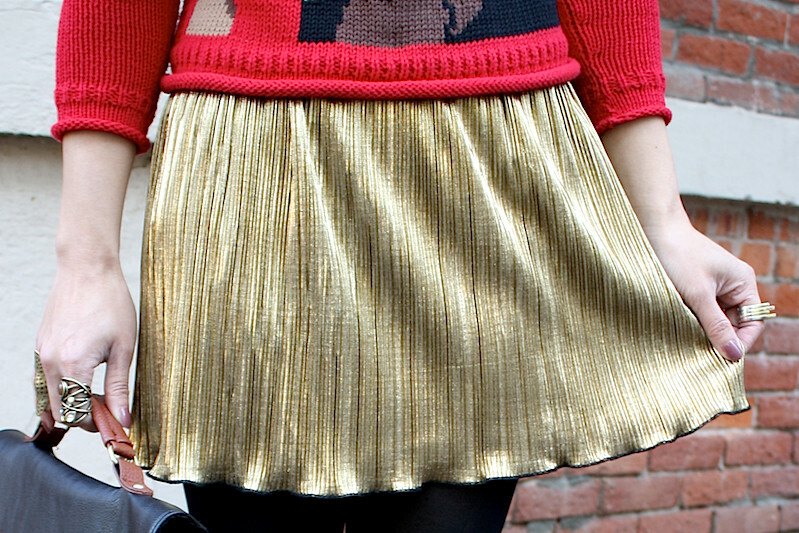 Shimmery gold pleated skirt from F21. 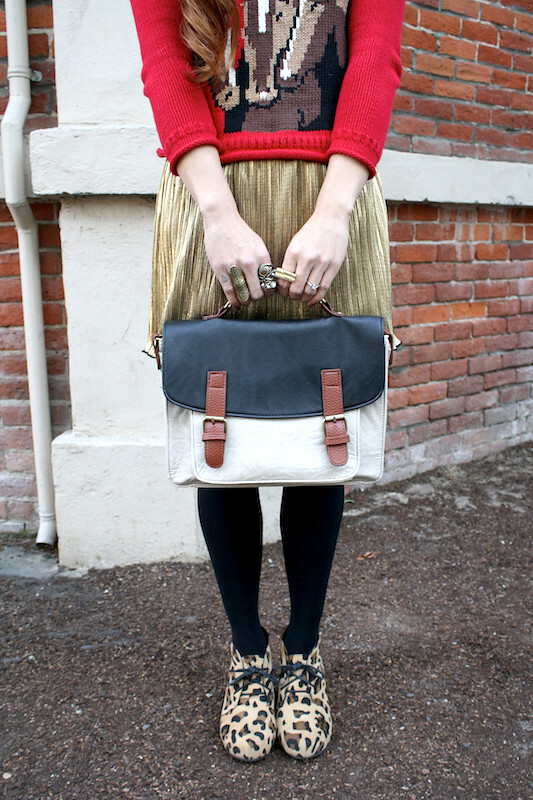 Two tone handbag from my work Sway. 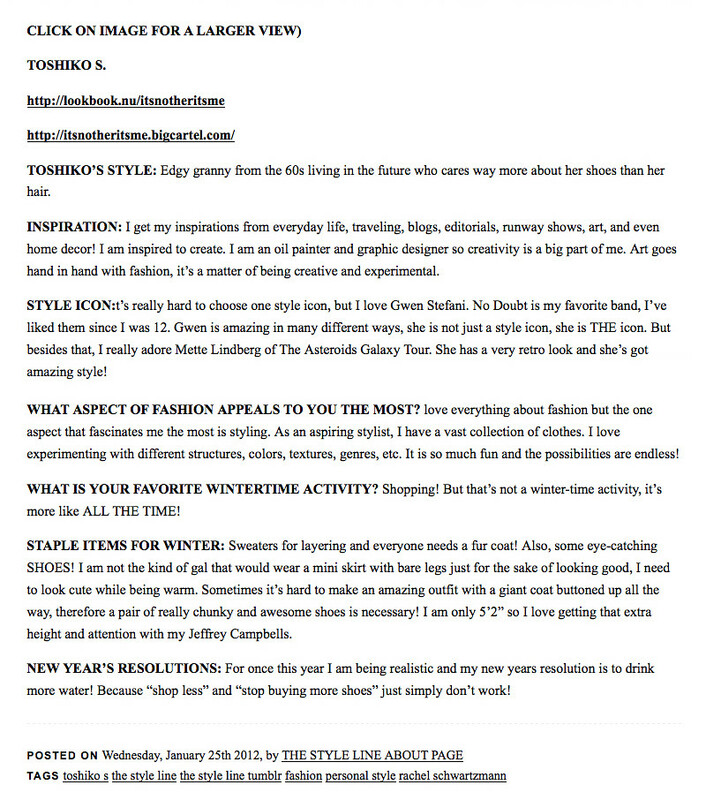 Having read so many blogs and seen so many different styles, I sometimes wonder if my personal style lack focus. 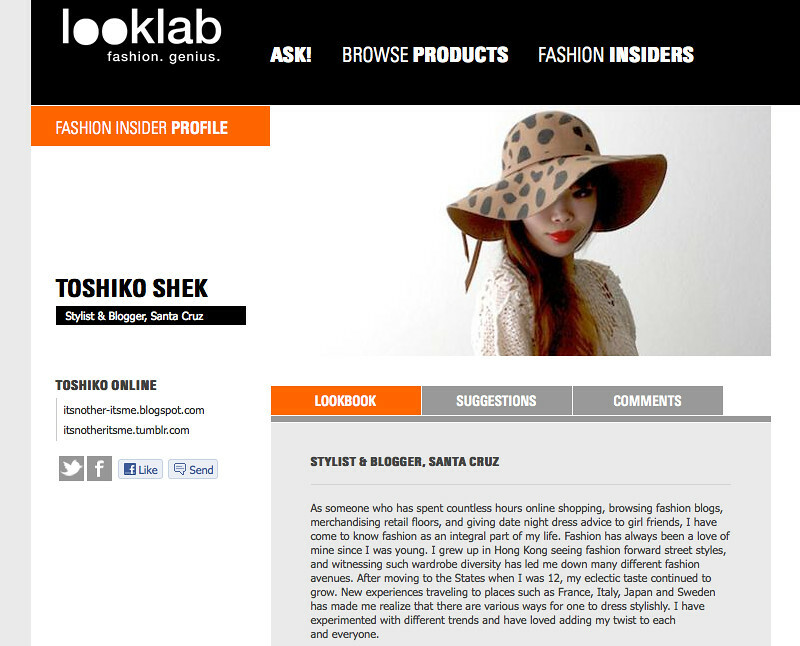 Many bloggers out there have a very specific look and therefore draw a very specific audience. I, on the other hand, have an eclectic style. 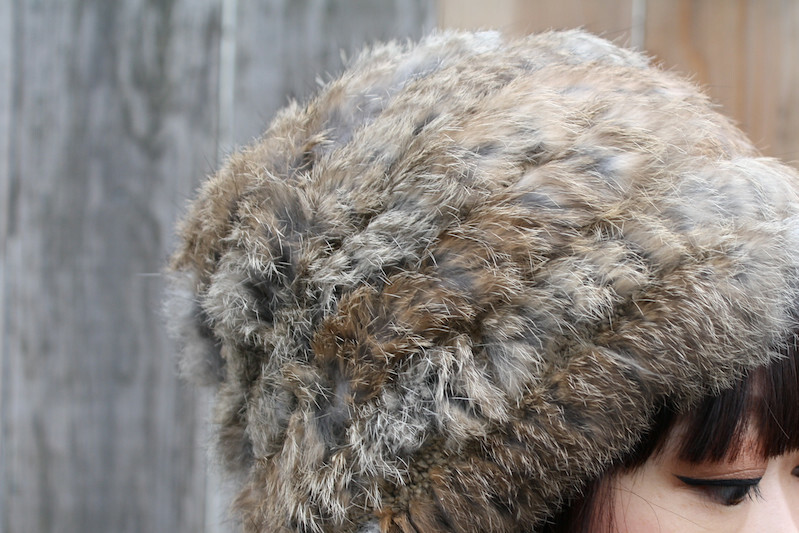 Sometimes I wear ultra feminine pieces with cute dressy shoes and a dainty little purse while wearing pink lipstick (like this post), other times I go for an edgier look in two tone fur coat with leather leggings and some chunky Jeffrey Campbells while rocking some dark plum color on my lips. 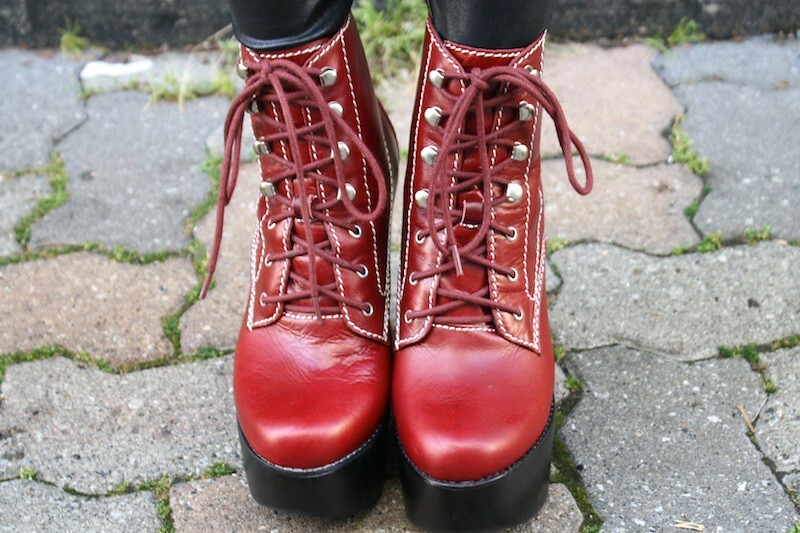 Then, on lazier days, I am layering up in cozy knits and kicking around in some boots. So, you see, I wear many very different kind of things. The more I think about it, the more I appreciate the fact that I can actually pull off such different looks. 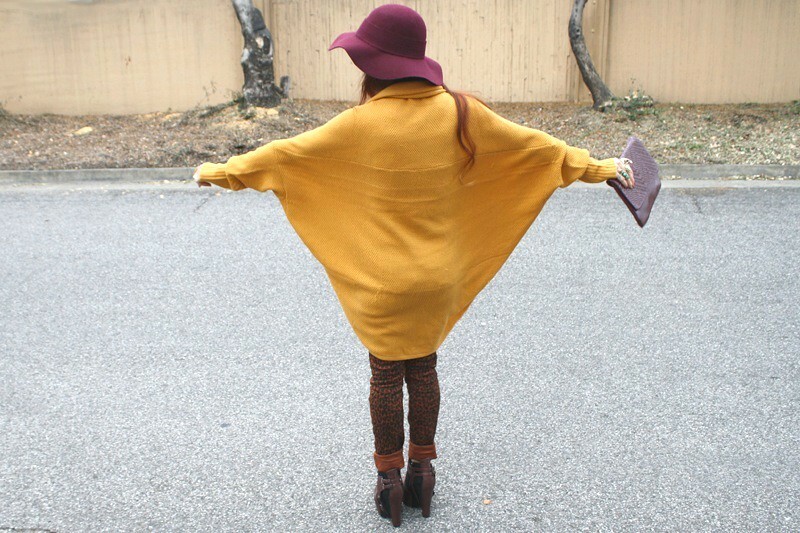 Some people are stuck with one look, but I can just wear whatever I want and still look decent! What are your thoughts? 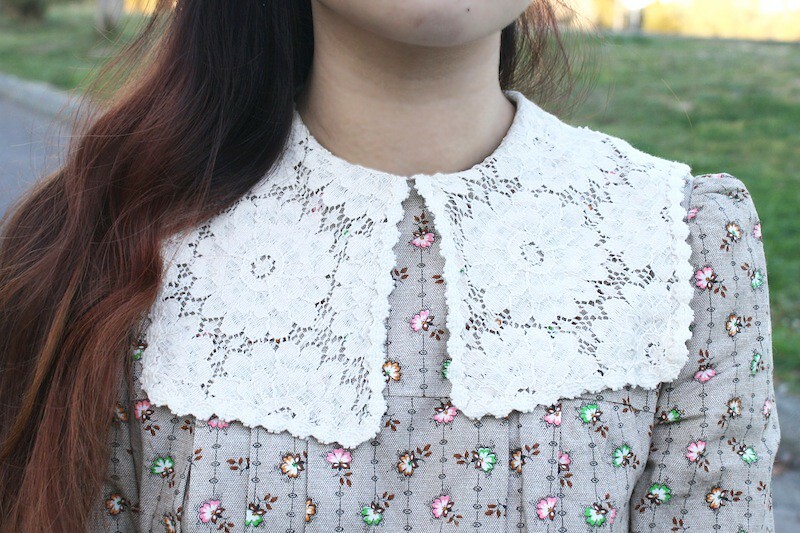 Vintage 60s lace collar floral dress from ebay. White patterned knit tight from Japan. Pink suede oxford heels by Promise. I previously talked about how I don't ever wear black and how I rarely wear pants... well, I have certainly been breaking the rules lately! I love mixing vintage with modern pieces, so it is no surprise that I would wear this vintage 60s dress with these futuristic looking wedges and sunglasses (giving away a pair of these half tint sunglasses, see details below). Lastly, I added a bright fuschia clutch and fuschia lip color to give this black and white outfit a splash of color! Thrifted vintage 60s daisies dress by Novel-Tee. Black and white wedges from Hong Kong. Half tint oversize sunglasses from it's not her, it's me. 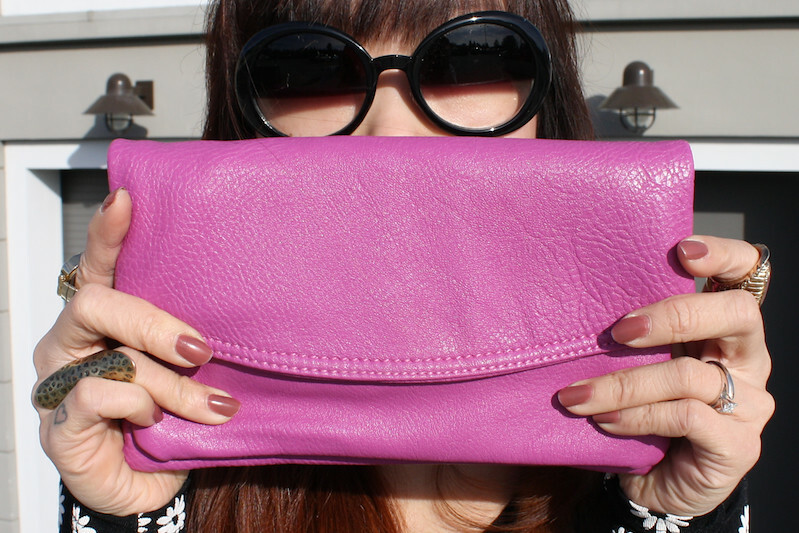 Fuschia clutch from my work Sway. I am giving away a pair of these awesome half tint sunglasses from my shop it's not her, it's me. 1. Follow my blog via google friend connect or blogloving. 2. Leave a comment here with your email and how you would rock these sunnies. That's it! Winner will be chosen at random and announced next Monday! Good luck!